The 2014 Horse Lake Trail Runs feature half-marathon and 5-mile distances. 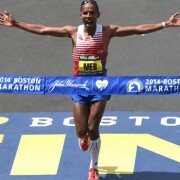 Walkers can participate in the 5-miler as well. WENATCHEE — Thank you, Mother Nature. The May 10 Horse Lake Trail Runs — a half-marathon and a 5-mile — should coincide with peak bloom of wildflowers in the Wenatchee Foothills. The second-annual event, which is part of the Wenatchee Valley Trail Run Series put on by organizing group RunWenatchee, is expected to sell out at 200 runners. A year ago, the race attracted about 135 participants to the Horse Lake Reserve, three miles northwest of Wenatchee and owned by the Chelan-Douglas Land Trust. In anticipation of the race, RunWenatchee is holding a work party in conjunction with the Land Trust this coming Wednesday from 5 to 7 p.m.
Those interested in helping out Wednesday evening should drive to the Horse Lake Trailhead and be ready to go at 5 p.m. They should bring water and wear running shoes or lightweight hiking boots. 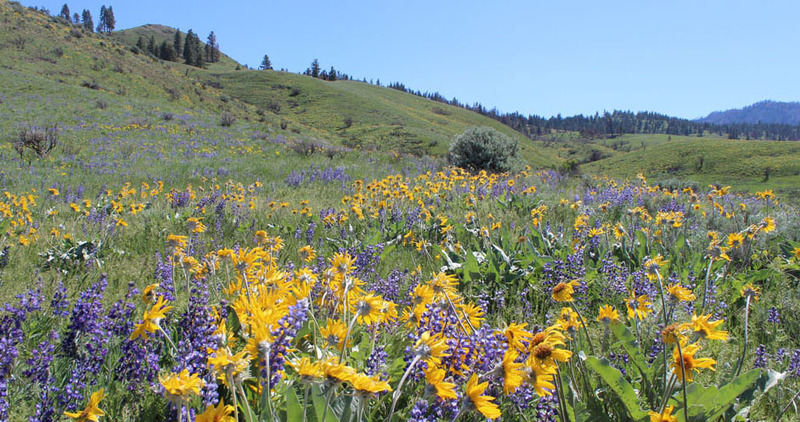 The Wenatchee Foothills should be populated with thousands of wildflowers, including balsam root and lupine, when the Horse Lake Trail Runs take place on Saturday, May 10. RunWenatchee and the Land Trust also are seeking volunteers to help out on race day, May 10. To volunteer, contact the Land Trust’s Hanne Beener at (509) 667-9708 or hanne@cdlandtrust.org; or RunWenatchee’s Joel Rhyner at (509) 387-0051 or runwenatchee@gmail.com. The Horse Lake Trail Runs are serving as a fundraiser for the Land Trust, with proceeds going toward a new trail on the reserve this year. Packet pickup and late registration will be held from 5 to 7 p.m. on Friday, May 9, at Pybus Public Market, and from 8 to 8:50 a.m. Saturday, May 10, at Horse Lake. The races start at 9 a.m.
On race day, the Mission Ridge Ski Team will shuttle runners from the Wal-Mart parking lot to Horse Lake Reserve and back, beginning at 7:30 a.m. People also can drive to Horse Lake on their own but parking is limited — only about 80 parking spaces. North Face and Great Harvest Bread Co. will have booths at the trailhead, and there will be water, sport drink and food on the half-marathon course and at the trailhead. 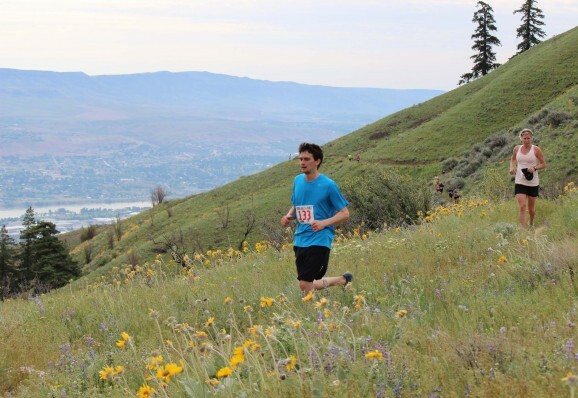 Horse Lake is followed in the Wenatchee Valley Trail Run Series by the Red Devil Challenge Trail Runs (25K, 10K and kids race) on June 8 near Cashmere and the Bavarian Battle Trail Runs (10-mile, 8K and kids race) at Leavenworth on June 22. The Leavenworth runs are being held in conjunction with the June 21 Bavarian Battle Adventure Race. Presenting sponsor of the Trail Run Series is Volyn Law of Wenatchee. 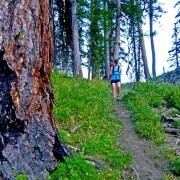 The trail run series is the first of its kind along the east slopes of the Cascades in Washington state. According to Matt Kearny, sports tourism coordinator with the Wenatchee Valley Chamber of Commerce, the estimated economic impact from the trail run series will be in the $95,000 to $100,000 range. That figure include visitor spending as well as funds being raised for the trail series’ three beneficiaries — the Chelan-Douglas Land Trust, Chelan County Mountain Rescue and the Leavenworth Winter Sports Club. “The Wenatchee Valley is perfectly positioned to offer world-class trail running right out our back door,” said Joel Rhyner, RunWenatchee’s race director of the series. In addition to Volyn Law, trail run series sponsors include Project Groundwork, Arlberg Sports, Mission Ridge Ski Team, Cashmere Valley Bank, Orchard Bar, Crunch-Pak, Milepost 111 Brewery, Icicle Brewing Co., Great Harvest Bread Co., North Face and Osprey Rafting. 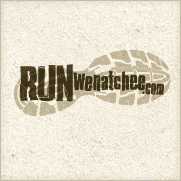 For more information on RunWenatchee, visit https://www.runwenatchee.com.